(Bloomberg) -- Among the 14 pages of goods targeted by the President Donald Trump’s administration for tariffs are some of Europe’s most expensive agriculture exports. Specialty cheeses made from sheep’s milk like Roquefort, Pecorino and gouda and wine are among the products that could face tariffs under the U.S. proposal released on Monday. 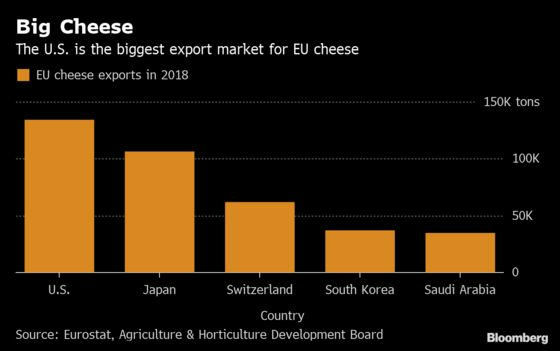 The U.S. is the European Union’s biggest export market for cheese, and half of the shipments could be impacted by the proposal, according to the Agriculture & Horticulture Development Board. “The producers who make specialty cheeses probably won’t be that worried,” said Richard Scheper, an analyst at Rabobank. Specialty cheeses are already expensive and it would be hard to substitute with American-made products in large quantities, he said. If the tariffs result in U.S. consumers buying less European cheese, then companies might have to find other markets, according to Patty Clayton, dairy analyst at the AHDB. “Processors will have less revenue and money coming in,” Clayton said. “There will be a price impact on the cheese market as a whole.” Still, the impact of any tariffs would be smaller than when Russia banned some cheese imports from the EU as retaliation for sanctions, she said.